Despite an unemployment rate at 4.1 percent or less since last October, wage growth has been anemic. In fact, over the last year, the average real wage of private sector workers saw no growth at all. While the total lack of growth in inflation-adjusted (real) wages over the last year is due in part to an increase in energy prices that is likely temporary, the slow real wage growth we’ve seen in recent years is mostly driven by nominal wages failing to rise quickly even in the face of low unemployment. Some have posited that our far-less-than-stellar wage growth right now could be due to workers not having the skills employers need. But that idea has the logic backwards. When employers can’t find workers with the skills they need at the wages they are offering, they will raise wages in order to attract qualified workers—if employers can’t find the workers they need among the unemployed, they will offer higher wages in an attempt to poach needed workers from other firms, who will then raise wages in an attempt to keep their workers, and so on. In other words, if there are skills shortages, we should see signs of faster wage growth for workers with needed skills. This fast wage growth for skilled workers should push up average wages, not weigh them down. Since we continue to see anemic average wage growth, not just slow wage growth for select groups of workers, it’s clear that there is not a widespread shortage of the types of workers (i.e., those with the right skills) that employers need. But we certainly hear widespread employer complaints about not being able to find workers. Why? One reason is monopsony power in the U.S. labor market. There is a lot of evidence that many firms have monopsony power, either because of a limited number of buyers of labor or other sources beyond labor market concentration. When firms have monopsony power, they are able to pay workers less than what their work is “worth,” i.e. less than their marginal product. But a key dynamic of monopsony power is that even though monopsonists would like to hire more workers, the low wages they offer mean they can’t attract more workers unless they pay more. That is, it is a normal state of affairs for a firm with monopsony power to wish they could hire more workers at the wages they are offering, but to be unable to attract additional workers because their wages are too low. So when a firm with the power to set wages below a workers’ marginal product complains about not being able to find workers at the wages they are offering, it’s useful to remember that they are choosing to keep wages low in order to increase profits—which remain high as a share of corporate sector income—and could get more workers by simply raising wages. And importantly, when firms with monopsony power complain about not being able to find workers, it is not adequate evidence of a skills shortage. What would be good evidence of a skills shortage? The footprint of a bona fide shortage of workers with certain skills is a low number of available workers with those skills combined with unusually strong wage growth for workers with those skills. The table below shows real wage growth over the last year by occupation. 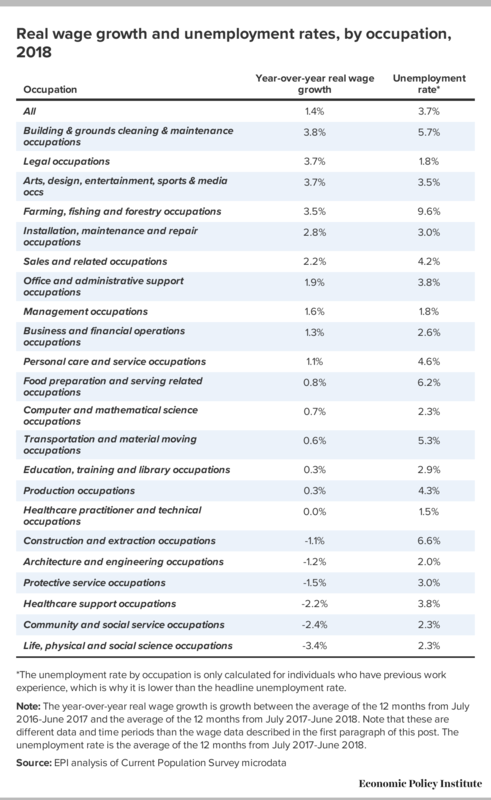 Legal occupations are the only occupations that come close to potentially hinting at a shortage, with wage growth of 3.7 percent over the last year and an unemployment rate of less than 2 percent. Computer and mathematical science occupations, which require skills that are often mentioned in conversations about skills shortages, do have a relatively low unemployment rate, at 2.3 percent, but have seen abysmal wage growth, at less than 1 percent over the last year. No widespread shortage there. Even construction, where anecdotes of labor shortages have been persistent in journalistic accounts, shows no evidence of widespread shortages—real wage growth in construction actually fell over the last year. *The unemployment rate by occupation is only calculated for individuals who have previous work experience, which is why it is lower than the headline unemployment rate. Note: The year-over-year real wage growth is growth between the average of the 12 months from July 2016-June 2017 and the average of the 12 months from July 2017-June 2018. Note that these are different data and time periods than the wage data described in the first paragraph of this post. The unemployment rate is the average of the 12 months from July 2017-June 2018. The story doesn’t change when looking by geographic area. We broke down the above table of 22 occupation categories by the nine Census divisions—resulting in 198 occupation/division cells (about as small of cells as CPS sample sizes allow). The scatterplot below shows the unemployment rate and wage growth of these occupation/division cells. Note: Observations are occupation/division cells. 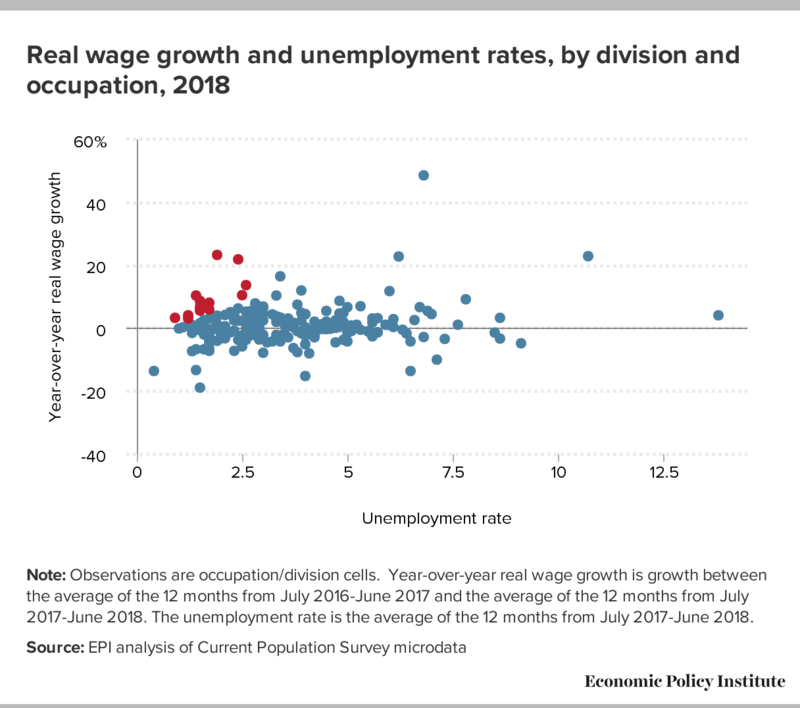 Year-over-year real wage growth is growth between the average of the 12 months from July 2016-June 2017 and the average of the 12 months from July 2017-June 2018. The unemployment rate is the average of the 12 months from July 2017-June 2018. To pick arbitrary-but-reasonable cut-offs for potential labor shortages, we singled out (in red) occupation/division cells that had an unemployment rate of less than 2 percent and wage growth greater than 4 percent, and also singled out cells with wage growth of 3 percent or more if their unemployment rate was less than 1.5 percent, and cells with unemployment rates of up to 3 percent if their wage growth was at least 10 percent. There are only 13 cells that fit these definitions, comprising just 4.5 percent of total employment. They include: legal occupations in the West South Central and South Atlantic divisions; management occupations in the East South Central, Mountain, and West North Central divisions; business and financial operations occupations in the East South Central division; protective service occupations in the West North Central division; computer and mathematical science occupations in the Mountain division; community and social service occupations in the West North Central division; healthcare practitioner and technical occupations in the West North Central division; arts, design, entertainment, sports & media occupations in the West North Central and East South Central divisions; and education, training and library occupations in the New England division. This smattering is what one might expect as a baseline in a system as large and dynamic as the U.S. labor market—there will always be some occupations in some places where there are not enough workers with the right skills. The key question is whether it is happening at a rate that is cause for thinking that the overall economy really is running hard into labor supply constraints. Right now it’s the opposite situation—and that’s a genuine problem. Remember, while labor shortages may be a negative for firms, they are a clear win for workers, since they lead to wage increases. Right now there is scant legitimate evidence of anything but isolated concerns about scarce labor, but in today’s environment of unusually weak wage growth, somewhat more widespread labor shortages that put upward pressure on wages would in fact be a welcome development.